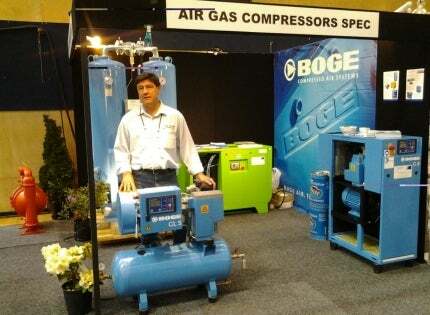 Air Gas Compressor Specialists are the sole New Zealand agents for BOGE and Quincy Compressors and suppliers of top-quality air compressors, air dryers and related equipment. Air Gas Compressor Specialists has the expertise to provide equipment to suit your job specifications, from a standalone compressor to a full turnkey solution. Air Gas Compressor Specialists offers a full range of high and low pressure, oil free and oil-lubricated, variable speed and base load, screw and piston type portable diesel and electric compressors. Air Gas Compressor Specialists offers a full range of portable diesel and electric compressors, which vary in high and low pressure, oil free and oil-lubricated screw and piston type compressors. They are also available with variable speeds and base loads. The smaller range of Sullair Portable Compressors are designed to be towable, featuring the option of an integrated air dryer, ideally suited to area’s where stringent restrictions are placed on noise emissions. The mid-range high-pressure unit was conceived for the tough demands on the oil and construction industries. They are designed for durability, reliability and efficiency. The large range of future generation, low and high-pressure screws can give more air output for less fuel consumption. One of the best has been improved upon: The S-Series has set standards in efficient and reliable compressed air production. Now BOGE has made one of the best screw compressor ranges on the market even better. While retaining the proven design philosophy, the efficiency, smooth running properties and the sound pressure levels have been significantly optimised. You can look forward to the best S-series of all time. A class of its own: The directly coupled screw compressor of the C-Series are space saving and extremely efficient at the same time. They are available with horizontal receiver and / or top mounted refrigeration dryer and can flexibly be adapted to suit particular application requirements. The Quincy 5120 Electric framed-in package provides 90cfm at 175psi of breathing air and / or industrial air. With years of proven dependability as an industry work horse, the Quincy 5120 features a reliable Weg TEFC 25hp motor with NEMA 4 starter box. It is simple to operate, reliable and versatile. The all-in-one package for dry compressed air, BOGE desiccant adsorption dryers are the ideal solution for compressed air pressure dew points below 3ºC. The heatless BOGE adsorption dryers can reach dew points of -70ºC (standard -40ºC). The twin tower system slows regeneration simultaneously with the adsorption eliminating the need for any external power supply. The environmentally friendly Seltorque range has the unique Selprime automatic self-priming system together with an easy operation and unparalleled reliability, coupled with inherent safety. Super silent, low emissions, designed to pump a full range of solids. Trailer options are also available. Perkins 2806A-E18TAG1A Diesel Engine with three-phase diesel generator and Leroy alternator. The engine also features an enclosed canopy sound-reduced set for supplying continuous electrical power at variable load. Brighter, warmer, safer: the Allmand light tower’s four-point outrigger design provides enhanced stability. SHO_HD parallel light fixtures provide more lumens per fixture than other light towers. The liquid-cooled diesel engine operates at 1800rpm, including a 7.5kW generator. Air Gas Compressor Specialists specialises in the service of all major brands of compressors, dryers, nitrogen generation systems, vacuum pumps and are recognised distributors of BOGE, Quincy, Donaldsons / Ultra Filter, SMC Pneumatics and Murphy switch gauges and parts. Air Gas Compressor Specialists has full workshop facilities, experienced technical staff, mobile onsite services and a 24-hour, seven days per week callout service. We provide turnkey solutions for new equipment and can help you access the best type of compressor and compressed air systems for your business requirements to fit your budget, as we offer the widest range of compressed air and vacuum solutions available on the market to suit every customer’s needs. Air Gas Compressor Specialists also performs full onsite auditing of compressed air systems and dryers to minimise wastage, maximise efficiency and reduce costs. When you need compressed air solutions for hireage, sales and service, contact Air Gas Compressor Specialists. Nong Yao oil field is situated in the G11/48 concession in southern Gulf of Thailand, approximately 165km off the coast of Thailand, in a water depth of approximately 75m.